The second memory carried far greater weight. Outside of Connecticut Hall stands a bronze statue of Nathan Hale. You remember him. American Patriot. Yale Graduate. Revolutionary Martyr. Regrets? He didn’t have a few. He had but one: That he had only one life to lose for his country. Only 14 years old, Nathan Hale’s parents sent him to Yale with his brother, who was two years older than Nathan. They roomed together in Connecticut Hall and both belonged to the Linonia Society where they often debated such topics as “astronomy, mathematics, literature, and the ethics of slavery” (per Mary J. Ortner’s article for the Connecticut Sons of the American Revolution). Rev. Edward Everett Hale said the young scholar also showed an interest in theatrical performances that “were not discouraged by the college government, and made a recognized part of the amusements of the college and the town.” Nathan Hale graduated at the age of 18 as one of the thirteen highest ranked students. With a not-so idle curiosity, the rakishness of a revolutionary, and the youthful idealism not unusual for someone of his age and time, Nathan joined George Washington’s spies shortly after the signing of the Declaration of Independence. He was the only man brave enough to answer Washington’s call for volunteers to go behind enemy lines and gather intelligence on British operations in New York City. Although accounts vary as to how it happened, he was captured and found with incriminating documents hidden in the sole of his shoe. 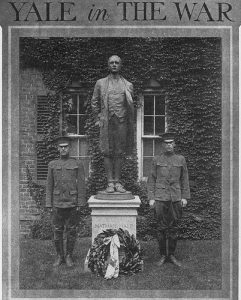 On the morning of September 22, 1775, at the age when most students graduate from college – twenty-one – Nathan Hale swung dead at the end of a rope. Some historians believe Bill Richmond, a loyalist slave, acted as hangman. Coincidentally, Yale itself barely escaped the wrath of the loyalists. After fleeing following an unsuccessful attempt to raid and burn the city of New Haven, the commander of the British fleet wrote of New Haven in his diary: “That place is a spacious and a very considerable town; it has the largest university in America, and might with proprietary be styled the parent and nurse of rebellion,” (Yale: A History, Brooks Mather Kelly, Yale University Press, 1974). That was then. In the past year, Yale seems to have shed its rebellious demeanor and, instead, has joined the Dark Side of politically correct loyalism. It has allowed intolerant chauvinists to: 1) Assault an innocent College Master (his only guilt was being married to a leading child psychologist who said something the politically correct crowd deemed incorrect); 2) Disrupt a seminar on (note the irony) freedom of speech and spat on alumni attending the event (of which the New York Times recently chronicled); and, 3) Led a successful but intellectually confused effort to remove a traditional academic title (“Master”) derived from the Latin word for teacher “magister” (because some apparently think history begins with the antebellum south). Perhaps the worst offense, though, has been the effort to remove the name of John C. Calhoun from one of Yale’s twelve (soon to be fourteen) residential colleges. Who was Calhoun? Let me give you a couple of hints. First, in 1957, a Senate Committee led by John F. Kennedy, named him as one of the five greatest senators of all time. Second, together with Henry Clay and Daniel Webster, Calhoun is part of the “Great Triumvirate, leading statesmen from the first generation after the Founding Fathers, who, though they represented opposing viewpoints, helped shape important aspects of our new and growing nation. Of the three, Calhoun was considered the “intellectual” to the more passionate Clay and the master wordsmith Webster. In addition to serving in the Senate and as Secretary of State, Calhoun was Vice President for both John Quincy Adams and Andrew Jackson. In today’s world, John C. Calhoun is not the respected public servant and accomplished orator and statesman who transcended party politics. Rather, he’s infamously known for his faithful representation – where he displayed his keen ability to debate – on behalf of the slave-holding southern states. Ignored is his equally faithful support for the rights of the minority and against what has been called the tyranny of the majority. We believe college is a cauldron of competing ideas, none of which is too radical to debate. We believe college represents an intellectual competition where your beliefs will be challenged. We believe college requires you to defend your beliefs when they are challenged. We believe college requires you to challenge the beliefs of others. We believe if you cannot meet the intellectual rigors of the college environment, perhaps you should not be in the college environment and instead should seek a different opportunity that better prepares you for college. Around the same time as that Doonesbury cartoon, the City of New Haven hosted the notorious murder trial of Black Panther leader Bobby Seale. Protestors filled the New Haven streets. The protests featured signs declaring “Free Bobby Seale.” One evening, a merry student prankster, armed with a bucket of white paint, quietly snuck up to one of the more prominent signs and changed the wording to “Fry Bobbly Seale.” Caught in the act, he spilled his paint as he fled, chased by a mob of angry protestors. It didn’t help that he dripped wet paint in a way that marked his trail in Hansel and Gretel fashion. While on College Street, he leapt on the masonry wall of one of the residential colleges, in the process, leaving a hand print of wet paint high on the wall. The name of the residential college where this historic piece of accidental graffiti was imprinted: Calhoun College. Nearly a decade after it was left, that handprint remained clearly visible as I walked down College Street. My guess is that it has since gone down some memory hole.